I was roasting a chicken the other night, and I realized that I’ve never posted a roast chicken recipe on my blog, which I really should. It’s my go to Sunday night supper, one we have at least once or twice a month. It’s elegant enough for company dinner, but simple and casual enough for a kitchen supper (if you had an eat in kitchen, which we don’t. Say it’s casual enough to eat while curled up on a couch, with a glass of $4/bottle Tempranillo and a DVD of Mamma Mia. Don’t judge.) It appeals to kids, picky eaters, those who don’t eat red meat. It doesn’t require fancy ingredients. And it creates wonderful leftovers which can be repurposed into all sorts of great things — chicken salads, chicken curry, and chicken stock (more on all of those, later). In short, roast chicken might just be the perfect meal. And as such, it’s my duty to share a recipe with you. I’ve tried many different roast chicken recipes — Martha Stewart’s Chicken with 40 Cloves of Garlic, Thomas Keller’s Roast chicken (which, incidentally is almost identical to my family roast chicken recipe, which was given to us by the Moroccan cook at my godmother’s in-laws’ villa on the Cote D’Azur), and the standard rub with butter and roast at 350 until it’s done recipes, but I always come back to this one, which I found in Judy Rodger’s marvellous Zuni Cafe Cookbook (incidentally, this is one cookbook I think every serious cook should own. The techniques are amazing, the recipes flawless, and the dishes wonderful). Judy Rodgers has converted me to dry brining — sprinkling the chicken with salt well before you want to cook it — which yields a tender and juicy chicken with a crisp, salty skin that is seasoned all the way to the bone. Dry brining can yield great results in any meat (even the Thanksgiving turkey), but a dry brined chicken is a thing of beauty and should be in everyone’s repertoire. This is really more of a technique than a recipe. The day before you want to roast the chicken, start with a whole chicken, not too big. 3 lbs is great, but anywhere up to 5 lbs is OK, too. 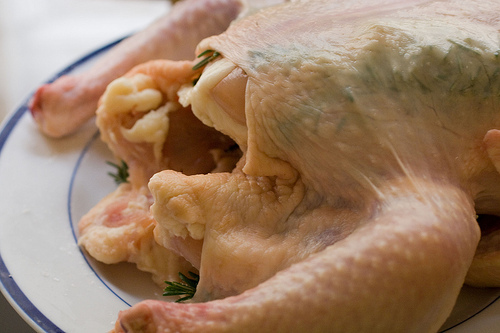 Pull out any gizzards and giblets from the cavity (most chickens come with some of the internal organs and the neck removed, packaged and stuffed back into the cavity), and rinse it off and dry it well. Using your fingers to separate the skin and the meat, make two pockets on either side of the breast bone between the skin and the meat, and then flip the bird over and make two more pockets between the skin and the thigh meat. Find some fresh herbs (the chicken I decided to finally photograph for you was made with rosemary, filched from a neighbor’s bush, but fresh thyme or sage or oregano also work well) — or some dry herbs (I’ve used big pinches of herbes de provence) or another aromatic of your choice (sliced garlic, thinly sliced lemon), and stuff some aromatics in those four pockets (I’ve done this without aromatics as well, and it’s still delicious). Then take sea salt or kosher salt in big pinches (Judy Rodgers gives an exact measurement — she is nothing if not precise, but I like things salty, and am nothing if not imprecise), and rub all over the skin, both on the top or breast side, and the bottom, or thigh side. Make sure the wings are salted, and the legs, and the skin of the breast. Sprinkle a little salt inside the cavity. Then put the chicken on a plate, and stick it in your refrigerator. “Wait!” you say. “Shouldn’t I cover it first?” No! The dry air in your refrigerator (ever noticed how limp your lettuce gets? It’s like the Mojave in there) will dry out the skin of your chicken, which will yield a deliciously crisp skin. Which, after all, is the best part. The next day (this recipe does take some planning ahead, but honestly I’ve salted the chicken the morning I’m going to cook it for dinner, and it’s still good, just not AS good), take the chicken out of the refrigerator, get your big cast iron pan (I use my 12 inch pan, but I used to make it in a 10 inch pan, when I had one), and stick the pan in the oven (without chicken, yet!) and preheat to HOT. 475 degrees usually does it for me. (It might help to disable your smoke alarms. Or at least open a window.) When the oven is HOT, put your chicken in the hot pan, breast up. (Judy very helpfully adds that you should hear it sizzle when the pan meets the meat. I will very helpfully add that cast iron is better than pyrex in this case, because the chicken can still be cool, and the cool meat meeting a hot glass pan will yield a notveryfun scenario. Trust me on this one). “Wait again!” you say. “Didn’t you skip a step? Don’t I have to stuff the chicken? Or at least truss it?” Stuffing it is unnecessary — an empty cavity will yield a more evenly cooked chicken. And trussing is unnecessary as well, although your chicken, with its legs spread wide, may look, as Julia Child said, a little wanton. Roast the chicken breast up for 30 minutes. After 30 minutes, brave the heat and pull out the pan. Using a combination of tongs, a spatula, silicon oven mitts, and fingers that are impervious to heat after many years in the kitchen, flip that puppy (errrr, chicken) over so the breast is facing down. Back into the oven for 20 minutes. After about 20 minutes, pull it back out, perform the flipping operation again, and it goes back in the oven for 10 more minutes. (The flipping ensures that the breast doesn’t get overcooked (read dry) before the thighs are fully cooked. The second flip make sures that you finish that breast meat so it’s nice and crisp). Pull out the chicken, let it rest a few minutes, and let the feasting begin. AND – I realized that I totally forgot to announce the Le Creuset winner! Based on Random.org, the winner is #17 Alaina. Congratulations! I completely agree that roast chicken is THE go-to Sunday night supper, and this is the technique I use as well. The best part is that, for those of us who like to eat healthy, you can discard the skin and still have flavorful meat because the seasonings were in those perfect pockets. Yum! Yes. Yes. Yes. The BEST chicken ever. The best chicken in the whole w-i-d-e world. I dry brine all my chicken now – even when I make Thomas Keller’s rather delirious fried chicken. It makes it even better than the wet brine he recommends. Now you must tell everyone about the salad that goes with the chicken. Very true Karen, but you must promise me that you will eat just a LEETLE bit of the skin. It’s so delicious, it’s a crime to let it go untasted. My compromise is that I eat the glorious, glorious skin when it is hot and fresh, but take it off when I’m using leftovers for chicken salads or curries. It’s not good cold, anyway. This a great idea. 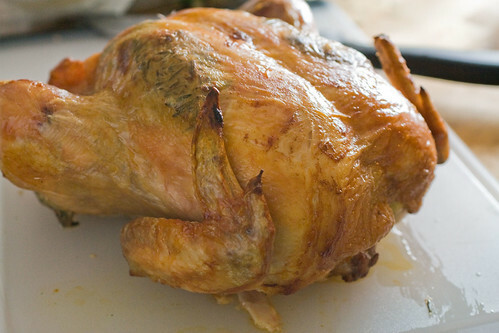 There are so many different ways to roast chicken. My family and I adore Ina Gartens roast chicken. You put a lemon halved and fresh thme and garlic in the cavity, and salt it really well and roast in 425 degree oven. WOW is it perfect. The gravy that goes with it is positivly amazing and easy. Try it with the recipe online, and I’m going to try this one.. I have followed this recipe all the way up to the cast iron pan part, and love the results. Next time I need to break out my cast iron and follow it through! Ahh how you luxuriate in Los Angeles. While saddened that you are not graced with an eat-in kitchen, your readers should take heart, Dear Kate, that you have a full DINING ROOM. (Remember your New York days when you just kept a table in the corner, or my early days when I had a flip up semi round off the wall with bar stools. Or the living room before that which was SEVEN FEET WIDE!) Not that I’m bitter. Beth — What I’d love to try is Ina’s chicken recipe but with the salting done a day in advance. Mike — It’s not so much a dining room as it is a dining room/home office/mail station/library/cookbook receptacle. But yes, that is why I no longer live in New York. When are you moving West? I actually JUST returned that cookbook to the library! I checked it out a couple weeks ago with full intentions to make one or two of the recipes. I didn’t quite make it past the first chapter (too busy! ), but think I still may need to check it out again. Or buy the darn thing! Now I totally want to try dry brining. Very interesting! We love roast chicken! Your method is great – love all the herbs! Roast chicken is my Sunday night meal as well. Eat half of it that night, then use the leftovers in lunches for the rest of the week. I have always wanted to try the Zuni method, and after seeing your photos, I’ll definitely give it a try next Sunday. so I am going to do this tomorrow for some family that came to visit…but I was wondering if I could marry this recipe with the Thomas Keller’s Roast Chicken with Root Vegetable recipe in a big roasting pan..?…?….or will it kill the whole fabulousity of the Zuni one? I’m so use to just sticking my chicken in the oven and leaving it. This will take some getting use to but it sounds yum.